The days are getting longer here in Colorado. Which means most of us we’ll be spending more time outside . Even though Colorado days can be downright hot, the evenings can still cool down, and bring a chill to the air. Instead of heading indoors, start up your gas fire pit. 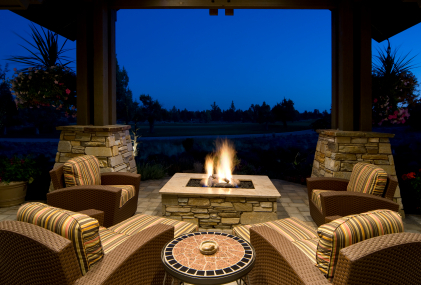 Gas and wood burning fire pits have increased in popularity over the past few years. Though there is a certain ambiance for an old fashioned wood burning fire pit, burning wood does release chemicals into the air, and runs the risk of setting other outdoor items on fire. A better alternative is a gas fire pit. A gas fire pit can be as simple as a few stones placed in a circle, with the gas line in the middle protruding a few inches out of the ground. Fill in with gravel, and cover the burner with lava rock granules. Or can be more complex, using concrete, stones, bricks and glass. Use your imagination, and make it an intricate part of your landscape or outdoor living room. Wherever you decide to locate your fire pit, your main priority is hooking up the fire pit to the gas line. Your licensed plumber can help you make your project a reality. In addition to the pipeline, make sure you install a shut off valve within 3 feet of the fire pit. Also check with your local ordinances and your homeowners association before building. It’s better to get full approval before you begin building, than have to tear down things after they’ve been built. Anytime you are dealing with gas, remember safety is the key. Check with your plumber to verify his experience working with gas lines.